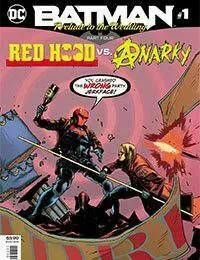 Red Hood has always been the one standing slightly apart from the rest of the Bat crew. Some see him as the Robin gone bad—which is exactly the kind of thing someone like Anarky can exploit. Now Red Hood is running security at Catwoman's bachelorette party—and if Anarky can crash it, that could be the final straw for Jason Todd!